Merchant and Hebrew scholar; born at Lemberg 1794; died at Vienna April 11, 1864. He devoted his leisure time to the study of Hebrew literature, and is the author of "'Aḳedat Yiẓḥaḳ" (The Sacrifice of Isaac), Vienna, 1833—a drama adapted from the Italian of Metastasio's "Isacco"; and of a Hebrew-German dictionary, "Ma'arik ha-Ma'arakot" (The Arranger of the Battle-Rows). The latter contains many philological notes on difficult expressions in the Bible. It was published by Max Letteris of Vienna in 1868, after the death of the author. 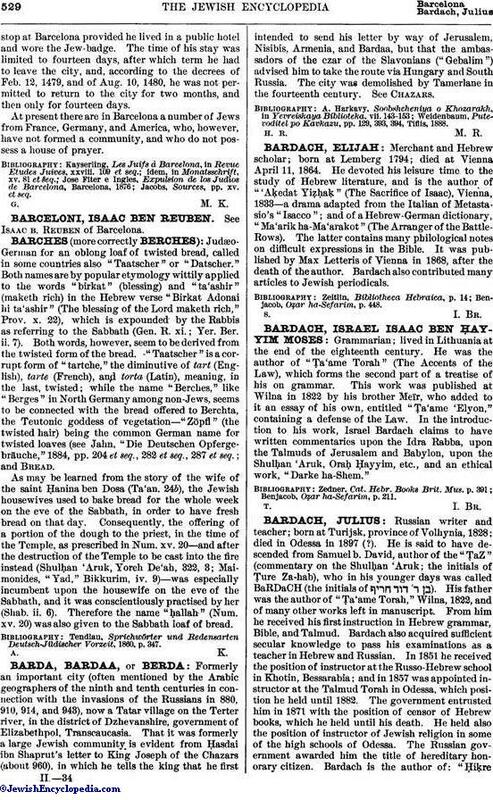 Bardach also contributed many articles to Jewish periodicals. Benjacob, Oẓar ha-Sefarim, p. 448.